Given the current climate crisis, there is no longer any doubt that the time has come to replace fossil fuel combustion engines. While some may consider hydrogen-powered vehicles to be the future of transportation, there is one feature inherent to hydrogen fuel that needs to be overcome: flammability. 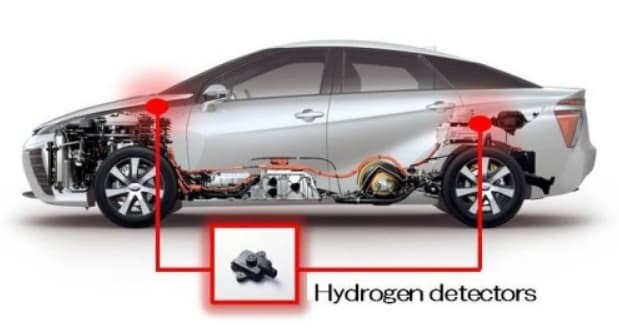 Since hydrogen is potentially flammable and explosive, hydrogen sensors are a critical part of hydrogen-powered fuel cells. The main task of a hydrogen sensor is to detect the presence of hydrogen gas. They monitor the hydrogen concentration in order to prevent and avoid the components failure. Sensors that detect hydrogen leaks are usually low-cost, long-lasting, easy-to-maintain compared to conventional gas detectors and have a compact design. These devices are used in many applications, such as electrolyzes, reformers, biomass tanks, but they also have the potential to realize commercial hydrogen-powered automobiles. By using palladium (Pd) nanoparticles, Researchers from Applied Nanotech Inc. have designed an innovative hydrogen sensor. The working principle of a palladium nanoparticle hydrogen sensor implies hydrogen dissociation on the surface of the material dissolving into the palladium lattice. This changes the palladium crystal structure, which results in increased conductivity of the palladium nanoparticle network. Nanosized palladium clusters change their crystal lattice at much lower hydrogen concentrations than in case of bulk palladium films (the traditional implementation for hydrogen sensing applications). This feature has expended a detection range so that the lowest detection threshold is 10 ppm. Generally, the main disadvantage of sensors using bulk palladium films is that, although hydrogen atoms can easily occupy sub-surface sites in the palladium lattice, continued diffusion into the bulk material is hindered. The use of nanoparticles in this new sensor avoids such an issue because of the fact that the nanoparticles have a larger ratio of hydrogen atoms to palladium atoms. Low concentrations of hydrogen are prominent if nanoparticle sizes are less than 30 nm. 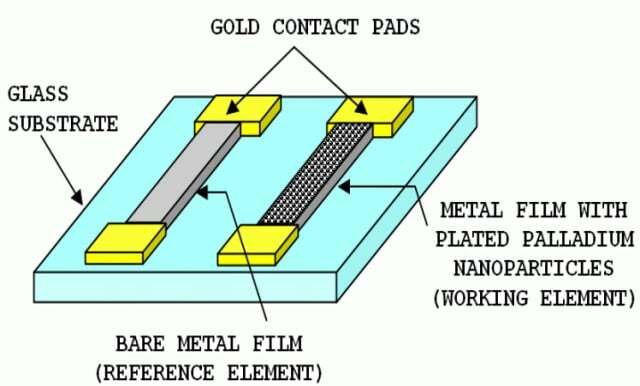 The use of such small nanoparticles has the additional advantage of extending the sensor’s operating temperature range.A nanoparticle sensor operates up to 120 ˚C, which is significantly higher compared to traditional bulk palladium sensors (50 ˚C). Also key is the fact that other types of hydrogen sensors, such as metal oxide, electrochemical and optical platforms are sensitive to other gasses, as well. A sensor that uses palladium nanoparticles, however, is very selective to hydrogen and does not produce false alarms caused by other gases, such as carbon monoxide and hydrocarbons. An additional advantage is that a palladium nanoparticle sensor has a fast response (in the range of seconds). The response time is dependent on the hydrogen concentration. In order to have a fast response time, it is important that the palladium nanoparticle network is not contaminated with chemical composites. To avoid contamination, the sensor surface temperature must be kept at 80˚C because the hydrogen diffusion rate grows exponentially with temperature. Hydrogen sensors are widely used in various industrial applications. It is a very important component and must be very reliable, since hydrogen gas is explosive even with a lower flammable limit of 4% oxidation. A high-performance hydrogen sensor using palladium nanoparticles has almost all of the properties critically important for such applications: high sensitivity, fast response anda wide sensing range.